Wherever I’ve lived, I’ve had a Sunday late-afternoon or early-evening walk that has helped me to work out those upcoming Monday returning-to-work blues. Sunday evenings growing up, my father and I, and sometimes my younger sisters and my mother (and a dog), would often hike at our closest wooded state park in Southeast Michigan—Highland Recreation Area. It was a time for us to talk about anything we wanted or to walk together in quiet peace. The place that has become that spot for me, and much more, in the Ketchikan area, is the Coast Guard Beach trail, where I offer morning and afternoon, three-hour guided hikes from May through September with beach add-on activities in creative writing, tai chi, and/or meditation. When the sun is out, this beach just can’t be beat. The beach is literally nearly in my backyard, as the south end of the beach begins at the north end of my neighborhood, and sometimes I walk to the beach from my house. But often I prefer making the quick drive to the elementary school in order to access the beautiful trail that takes me to the north end of the beach. 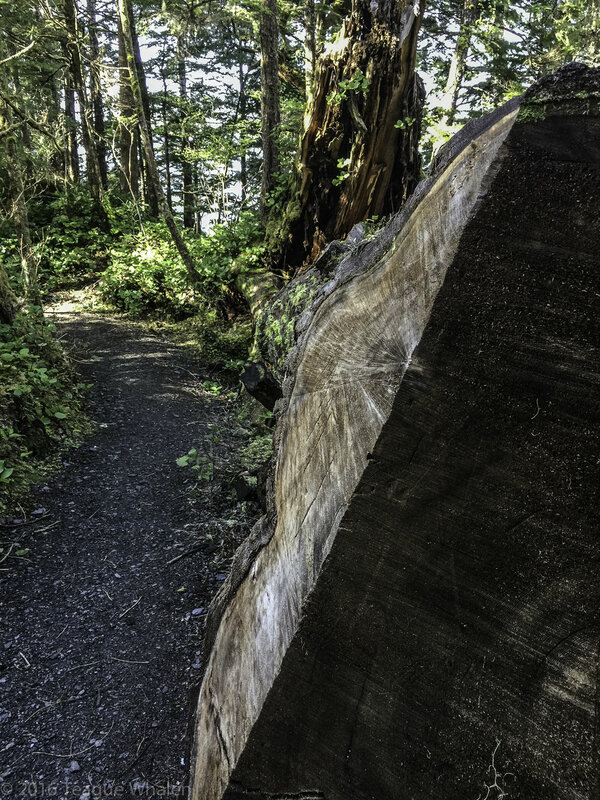 The gravel trail was built by a local group of volunteers and winds through Ketchikan Gateway Borough land and then crosses into Alaska Mental Health Trust Land. The first stretch of trail walks along the edge of a large muskeg flat overlooking a background of mountains over the treetops. Here, silvered and charred pines stand naked due to a 4th-of-July fireworks mishap one dry summer. This muskeg reminds me of the flat, jack-pine-riddled wetlands of Michigan’s Upper Peninsula where I used to live, a place that sees its fair share of forest fires. After the muskeg, the trail bears right and begins stepping down into the rain forest, where huckleberries and blueberries can be found in season. Mostly the trail descends to the beach; however, a few hills do rise along the way. Occasionally, a large western red cedar stands beside the trail. One had fallen across the trail just before my girlfriend and I ventured down during our first weekend together. The large trunk can’t be missed now as it berms the north side of the trail. Here you can begin to see glimpses of the how close you are to the ocean through the thinning branches. Just around the corner is a steep, rocky descent to a smaller stone-cobbled beach on the right. I recommend only sure-footed hikers or those who are confident in their use of trekking poles to navigate this unmaintained branch off of the trail. Depending on the tide, this can be a very nice beach for some limited privacy, that is until the next hikers decide to join you or the fishing boat begin to float by. At this beach you get a nice view of the Cleveland Peninsula--the main land jutting out to bisect the Behm Canal from the Inside Passage--and a limited view of Prince of Wales Island across the way. Once when taking a group of friends down this trail, one friend’s rock-chewing dog was in heaven on this beach and couldn’t get enough of chomping on cantaloupe-sized rocks and prancing around with each one. Moving on from here, soon a longer hill rises with some steep slopes falling off the side of the trail, so watch your footing. On the backside of this hill are some shorter but steep descents that may be best navigated with a trekking pole for those who are not sure-footed or very balanced. Once while hiking along quietly here, I heard a whale exhale out her blow spout; she was that close! Soon you will cross a wooden bridge over a small creek, where you should be able to see and hear the ocean meeting the wave-polished stone beach. The trail will dump you right between two outcroppings of jagged rocks, where if the tide is low, you can walk out onto the beach, which opens up wide to the left. If the tide is higher, I like to sit on one of these outcroppings and just watch the ocean, sky, and the distant mountains of Prince of Wales and Cleveland Peninsula. Once while sitting here, a rookery of seals dove beneath the surface and swam toward me, pushing the herring toward shore where the seals could trap and eat them right in front of where I was perched. Then they’d swim back out from shore, regroup, and do it again. For forty-five minutes I watched them do this until they moved on. If the tide is high and you want to access the rest of the beach, you will need to cut through the forest on the left and hop across a creek, where there’s a half buried, rusted out, army-truck chassis. It seems without fail, many different waterfowl can be seen coming through or floating out on the ocean here. Besides seals, sea lions sometimes make an appearance, and occasionally orcas and humpback whales. One sunny fall afternoon, my girlfriend and I watched humpbacks’ blow spouts occur in multiple directions. Only accessible by boat or foot, this rocky pine shore reminds me quite a lot of Canada’s north shore of Lake Superior, my old stomping grounds. And one of the things that I miss the most about the Great Lake State of Michigan, I can sometimes hear at Coast Guard Beach—the simple, rhythmic sound of waves crashing on the shore. Takes me right home. And because of this, this beach is one of my favorite places to do tai chi. This beach is an excellent place for walking, sunbathing, beachcombing, photography, writing, meditation, tai-chi, just sitting, marine-life viewing, and dog swimming. And often in the summertime, all of a sudden a cruise ship floats out of the woods on the south-end of the beach and fills your view on its way to points north. Another time, my girlfriend and I saw a cruise ship heading toward the Behm Canal that goes around our island, Revillagigedo, instead of heading north towards Wrangell and Juneau. I said, “Something’s not right. Are they lost?” And then the ship turned around and was heading for Prince of Wales, still the wrong direction. Next it was heading back our direction. We watched this silly back and forth a bit and then hiked out. The next day we heard that the ship’s steering had broken and they had limped back into Ketchikan and waited until someone could fix the broken steering. On a quieter day, I saw two men further down the beach, standing bare-chested and waste-deep in the ocean, their forearms and open palms reaching out as they faced the north and chanted in a language I didn’t understand. They looked cold, but tough and determined. After they slowly backed out of the ocean, they built a small fire, dried off, and dressed. My girlfriend knew that I really wanted to go over and talk with them in order to find out what spiritual activity they may have been engaged in. But I respected whatever their ritual was and gave them their space. They did make me think of something that I had read by the late Alaskan marine biologist and writer, Eva Saulitis, who states in her book Leaving Resurrection: Chronicles of a Whale Scientist: “According to traditional stories of Old Chenega, humans turn into killer whales when they die. When killer whales come close to a village, the people believe they are calling someone” (183). While attending the Association of Writers and Writing Programs’ annual conference in Seattle in the spring of 2014, I had the luxury of seeing Ms. Saulitis share the stage in Seattle with former Alaska Writer Laureate, Peggy Shumaker, and former Pulitzer-Prize winning poets, Robert Haas and Gary Snyder. Sadly, in January of 2016, Eva died from breast cancer, but I take heart that she has returned to the ocean in the form she may have loved most, that of a killer whale, the very thing she dedicated much of her life to studying. And with a little patience and luck, you might just be graced with a pod of orcas that sometimes passes through these waters just off of Coast Guard Beach, on their way to who knows whose village they may visit next, as bits of poetry trail behind in their wake.